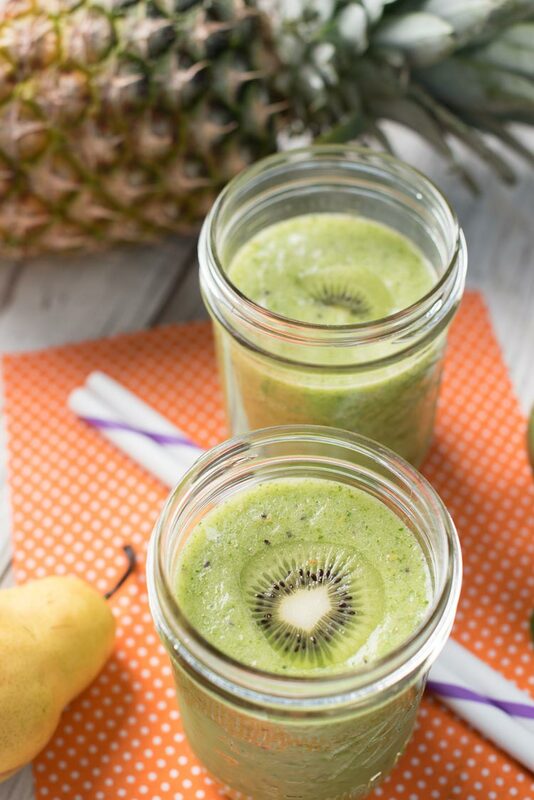 I hope you’re in a tropical kind of mood because today we’re sharing a Kiwi Pear Spinach Pineapple Smoothie Recipe. I know, that’s quite a combo, but it works! Read on for the details as well as our solution for what to do with any leftover smoothies. 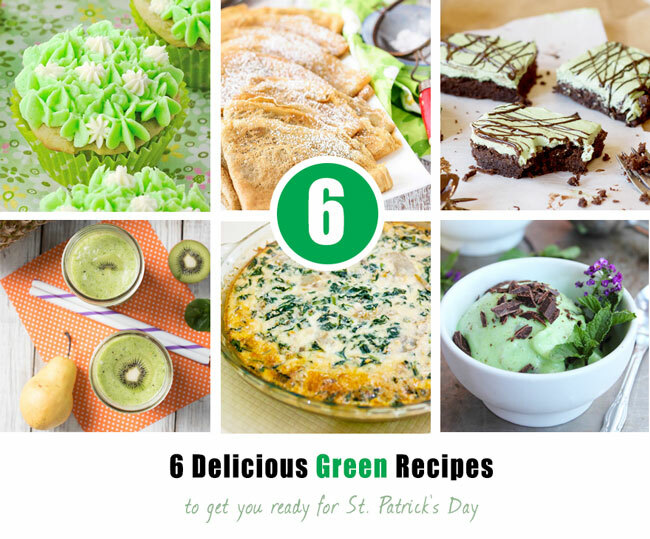 As a bonus, for today’s post, we’ve teamed up with other bloggers on a green recipe theme to prepare you for St. Patrick’s Day. 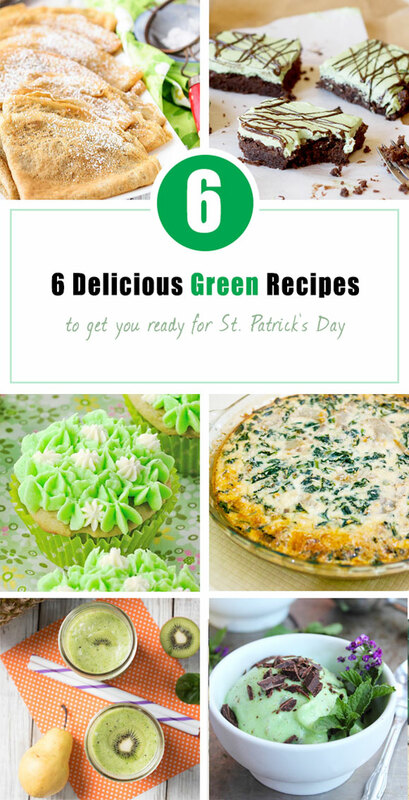 You can find links to all the recipes at the bottom of this post. We eat a lot of fruit in our house. 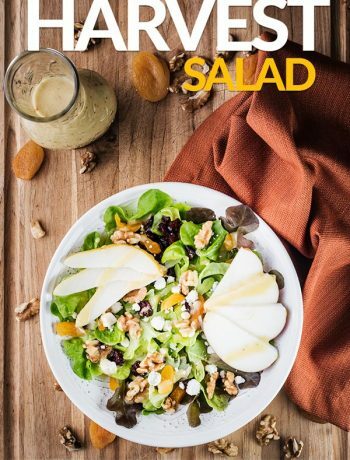 This stems from just trying to lead a healthy lifestyle which means getting your daily dose of fruits and vegetables. With 3 kids to feed this can be a challenge, especially with vegetables, but sometimes with fruits as well. Luckily smoothies have proven to be a helpful solution on both fronts. Our kids tend to really like smoothies like this Blueberry Peach Almond Milk Smoothie and it’s a great alternative to having a bowl of fruit on your plate. But we’ve also found it’s easy to sneak some vegetables in our smoothies as well. If we do this gradually, the kids don’t even notice! (Shhh) So we serve them things like this Tropical Kale Green Smoothie and this Strawberry Banana Spinach Smoothie. 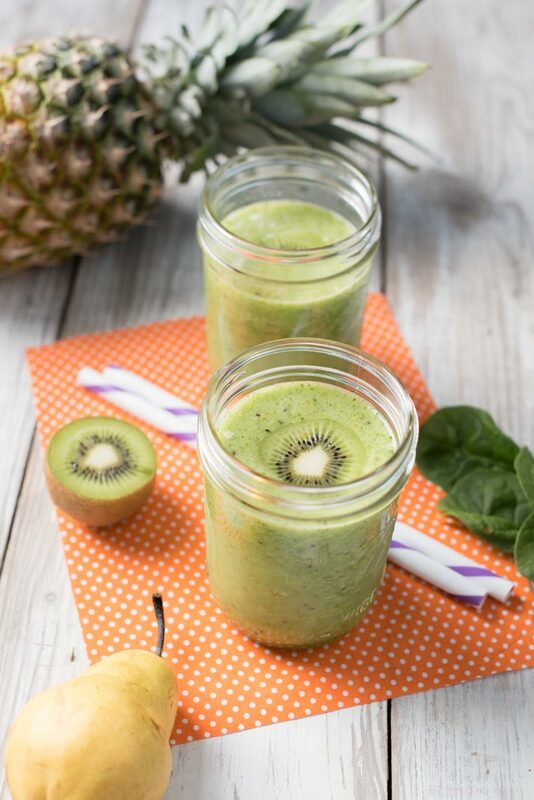 It’s an easy and delicious solution to getting them to consume some fruit and vegetables so when making this kiwi, pear, and pineapple smoothie we figured we’d sneak in some spinach as well. We’ve also found that smoothies are a great way to avoid wasting fruit. Somehow when feeding our kids we end up with half a cut up serving of fruit–maybe it’s because we have three kids and when you cut 3 servings of half a pear, you end up with one half left over? When it’s a half a banana, we just cut it up and throw it in the freezer or make a smoothie for the the grownups. Lots of other times, we have a store run planned and we know it’s time to clean out the old before it goes bad and and make room for the new. So sometimes that means coming up with a Kiwi Pear Spinach Pineapple Smoothie recipe. This smoothie recipe originated for that exact reason. We found we had half a pear, half a leftover banana in the freezer, kiwi on the counter, some pineapple from the freezer (I don’t like ice in my smoothie so frozen fruit is key for us), plus some spinach. So I threw it in the single serve cup with some water and blended away. Everyone tried a sip and liked it so now we often make larger batches. 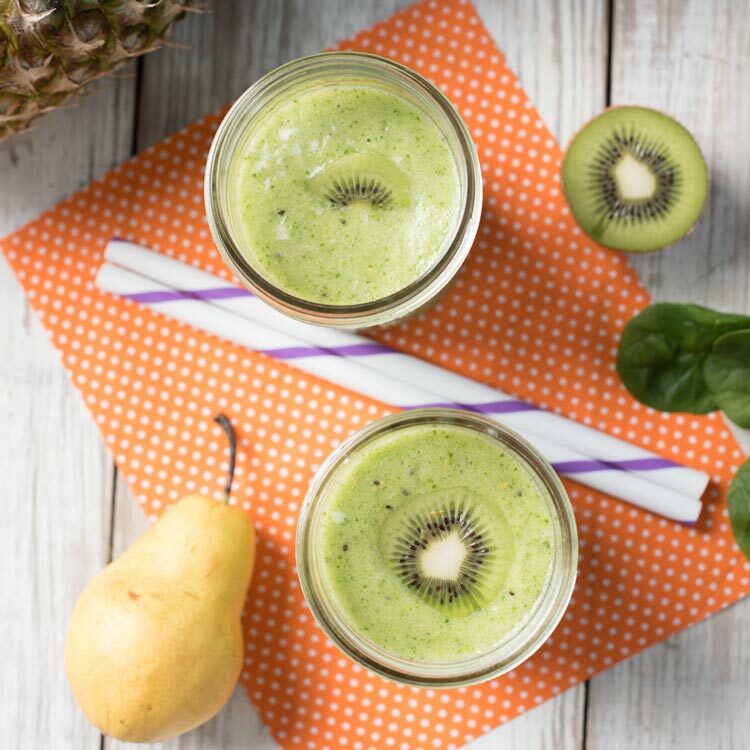 Our Pear Pineapple Kiwi Smoothie is an example of how experimentation can not only help you avoid waste, but lead you to new favorites. Let your produce guide you. 🙂 If you have pears about to go bad, come up with a pear smoothie recipe. 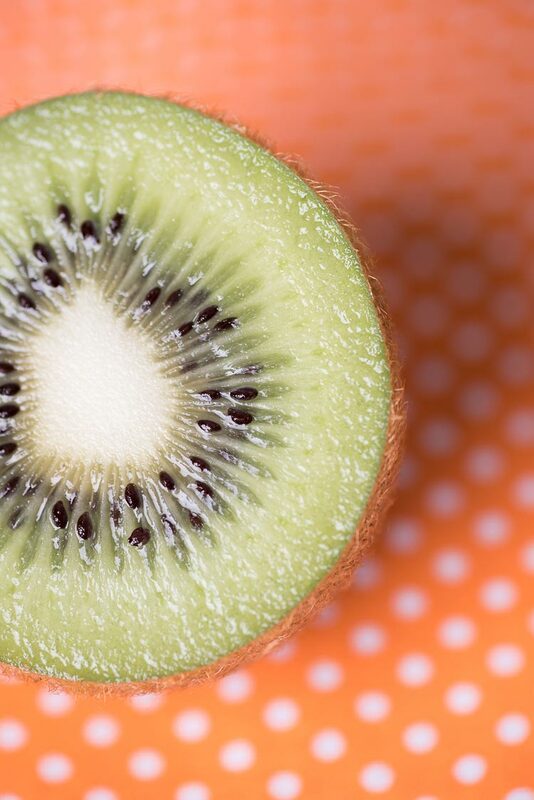 Or maybe it needs to be a kiwi pineapple smoothie. Or a spinach and pineapple smoothie. 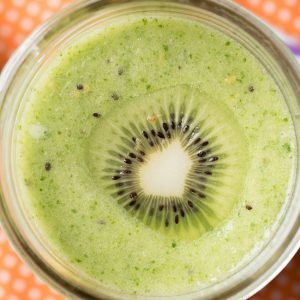 In this case it became a Kiwi Pear Spinach Pineapple Smoothie recipe. Whatever the case may be, try to stay creative and find ways to make sure you use up or freeze old produce. 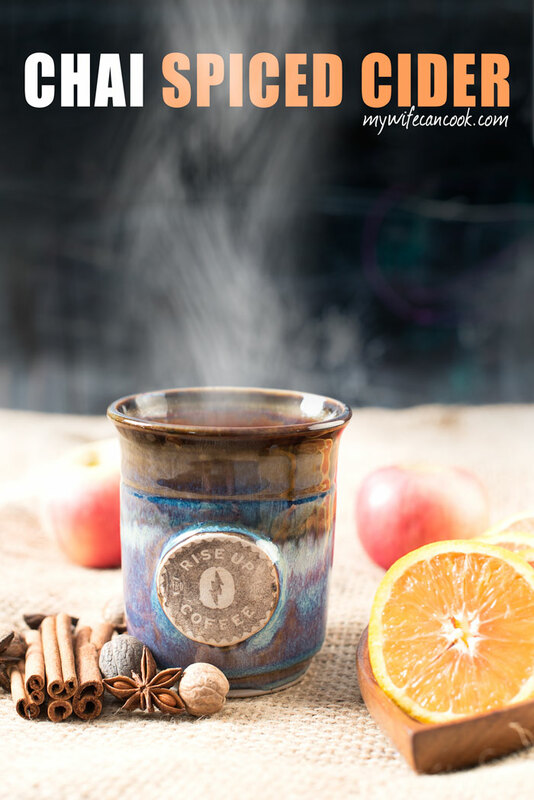 The freezing option can work out really well if you have space and it is an item that freezes well because most smoothies benefit from a frozen element. You need a good smoothie blender! Have you ever tried to make a frozen pineapple smoothie or any other smoothie with frozen elements with a crappy blender? It’s not the best. No one likes big chunks in their smoothie (usually). So if you make smoothies on a regular basis you’ll probably find it’s worth investing in a good blender. About six months ago we purchased a Ninja blender because our older blender quit working. I hemmed and hawed about whether to just buy another cheap blender or to really upgrade to something like a Vitamix (I wish!). Ultimately I decided to go with the Ninja. It seemed like a good middle of the road solution and we have been very happy with it so far. We can make giant batches of smoothies and it blends up frozen elements really well. All in all, it’s much less grumpy than our older blender. And that makes me happy. So do yourself a favor smoothie makers and don’t skimp too much on your blender! Do you ever find that you make a large batch of smoothies and you just can’t get through it? Usually it’s okay in the fridge overnight if you are going to consume it the next morning, but after a while it starts to separate and it’s just not the same. Luckily we’ve come up with the perfect solution! And one our kids love. you can make them in endless varieties. But if we don’t want leftovers for smoothie pops, we can also use the individual smoothie cup that our Ninja blender has to make a single serving. I frequently make my smoothie after the kids have their breakfast with their fruit leftovers plus some greens. I love this combination..!! 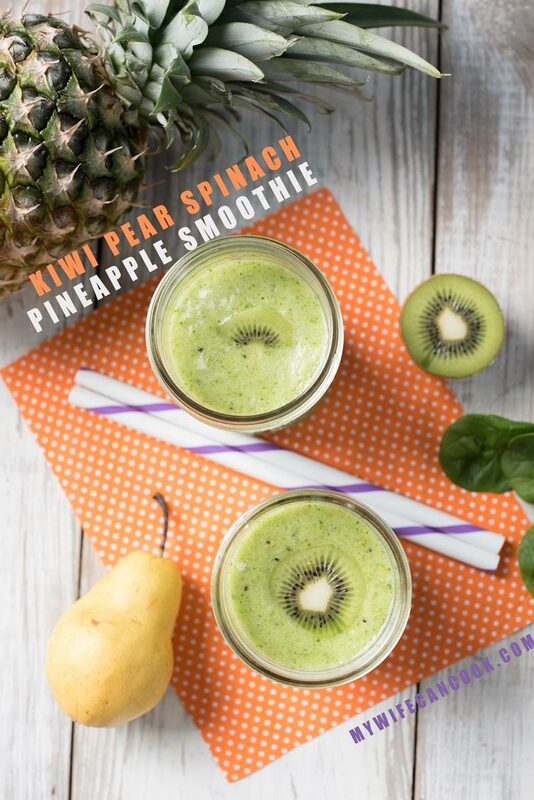 Kiwi, pineapple pear and spinach.. yum.. ! Love the left over Popsicle idea too. In fact I often make smooth just so I can freeze them in summer for the kids treats. Thanks. 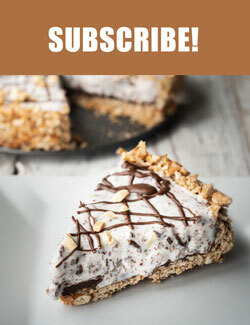 It’s so convenient to make them for treats! And the kids usually don’t realize they are also really healthy! 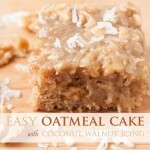 I love these kinds of accidental recipes that become a staple! The smoothie sounds delicious and the popsicle smoothie is genius! Thanks, we love this new combo and the smoothie popsicles are always popular with our kids! Love smoothies for lunch. I can blend it up…and head back to the computer. This sounds delicious and so tropical. Can’t wait for the warm summer weather!! We eat them at lunch sometimes too! I have definitely reached the point where I’m ready for warm weather! That flavor combo sounds amazing! 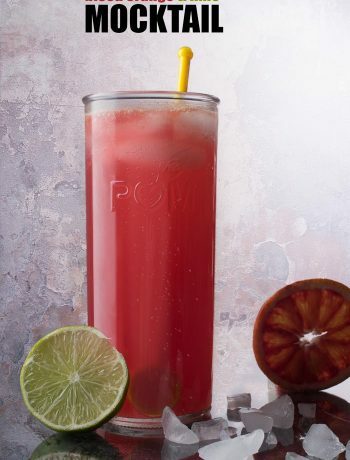 A little bit of sweet and tart all mixed together – perfect! It really worked out well! It’s now one of our favorites! I love smoothies… and I loooove pineapple. Smoothies don’t last long here at my place but I love the idea of making extra for later – especially as fruits go out of season! This is perfect to welcome in some tropic sun! Thanks. Smoothies are definitely a staple in our house and such a good way to get kids (and grownups) to eat more fruits and vegetables!